Liquor Barons resident wine writer Erin Larkin was one of Australia’s top 30 wine journalists invited to attend the exclusive media preview tasting in Melbourne, and here she shares her views and notes from the release. For the first time ever, Liquor Barons has secured a substantial allocation of Penfolds wines from this new release. We are the only independent banner group in Australia to secure an allocation, so it’s a big deal. Get in touch with your local store to lock down your picks, ahead of the release in store on Thursday the 18th of October! 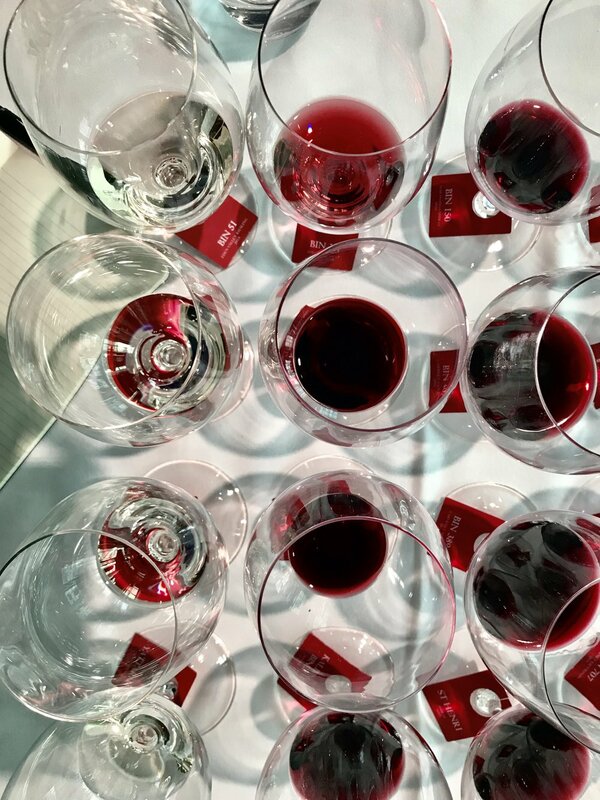 The Penfolds annual release is typically something to get (very) excited about. Somehow, Peter Gago (the Chief Winemaker, showman, ambassador and magnetic, charming personality) manages to translate Australia’s most iconic and recognisable luxury brand into something that is approachable, understandable and desirable. Naturally, the wines are always up to scratch, so it’s a morning that unfurls into a day of great wine, lively conversation and strangely, poetic prose. 2014 – 2018. 5 vintages. ⭐ Denotes ‘definitely buy’ if you’re in the position. A bottle, a case, whatever your preferred style dictates… these wines are exceptional. And with their price taken in to account, they are highly (highly) recommended. Lime blossom, Greek yogurt, green apple skins, shaved cucumber and sweet pea florals. Talcy palate, fine minerality. Lovely line and length. The acidity is bright; the palate is plush and ripe. A soft, full and desperately pleasurable Bin 51. Purity is the key here, and it wears its Eden Valley regionality on its sleeve. Fine matchstick complexity on the nose and palate – yellow peach, red apple skins. The impact of the small percentage of new oak is gentle and imparts pistachio, hints of saffron and layers of turmeric. Finger lime, dragon fruit and lemon curd. Lovely. Bin 311 spends 8 months in French oak (25% new). After Schroeter’s mouth-watering 2016 rendition of the same wine, I was more than a little eager to look at this 2017. It was a cool and wet growing season in the Hills, but what that has produced is something truly lovely. Crushed graphite, red apple skin, oyster shell, white peach and cashew on the nose. The usual nashi pear, white pepper, stone fruit and saline lick on the palate; the wine retains purity and precision whilst being layered, complex, and very ‘solidsy’. This is an absolute cracker. Long. Concentrated. Nervy. Complex. Full. Reserve Bin A spends a relatively short time in oak – 8 months in French barriques (40% new); 100% malo, hand-picked, whole bunch pressed and all wild yeasts. 2016 experienced almost ideal growing conditions across the four regions and with good yields. Incredible restraint in the glass; fine and elegant, there is latent power here. The flavour and impact rests on the back of the palate – it is all stone fruit, brine, crushed quartz… this goes for an age. Very (very) long and powerful. Totally different to the Bin A – this is polished, glossy, restrained and with astounding persistence of flavour. 8 months French oak barriques (35% new). Typically glossy Penfolds shiraz is bolstered by mulberry and earth from the mataro. The palate is succulent and delicious – the savoury and sweet of the two fruit profiles meet harmoniously on the mid-palate. If you’re a sucker for mataro (I am), you’re a sucker for mataro. First vintage was 1960. 8 months in French (10% new) and American oak. There’s enough fruit, structure and acidity to cellar this, but it is in such a great place right now. This is the bargain of the release. The cabernet sits atop the shiraz here – black currant, black pepper, leather/cigar box and bay leaf. The palate could almost be described as succulent – the concentrated core of fruit unfurls out across the finish. Closed at this early stage, but a polished rendition of the classic Aussie blend. 10 months in French and American oak..
Red cherry, cola, sarsaparilla. Pretty. Silky and fine. 9 months in French oak (30% new), 15% wholebunch, hand-picked. Supple and juicy, a lovely wine with berries and black jube. The palate is medium weighted with a soft swoosh of acidity. It is kind of mouth-watering in a juicy/ moreish way. Pleasure and satisfaction in this glass. 12 months in French and American oak. It sounds obvious… but what a wonderful shade of red – really ruby and bright. Gah! Delicious. Supple, chewy, vibrant. Totally wonderful. What more could you want from a drink. The cool climate fruit lending bucketloads of spice – we’re talking sweet paprika, white pepper, pink peppercorns… the fruit is red berry, summer raspberry, black currant pastille. The tannins are grippy and chewy. Everything about this is delicious. 12 months in French oak (30% new). This will cellar (10-15+?) but why would you? Darker in fruit spectrum than anything that has come before it today. The fruit here is powerful, tannic and rich. This is crushed black pepper, game, tobacco leaf, blackberries. The tannins are grippy and pervasive. Where the Bin 128 is elegant and subtle, this is black-hearted, meaty, brooding and very serious. 12 months in American oak hogshead. Mulberry, summer raspberry, fresh and beautiful. The palate, while full, is vibrant and plush – there is plenty to love here. There is a real savoury character to the fruit – like red dirt, tomato leaf, saltbush. This is just gorgeous! Bin 150 holds the Barossa flag high and proud – from nowhere else in the world does Shiraz taste like this. It’s hedonistic really… unapologetic. Totally old-school – if you yearn for that ‘Barossa feeling’… this is where you’re gonna get it. 12 months in American oak (25% new), and French (7% new) hogsheads and puncheons. Blackcurrant, but it is redder than that… crushed pink peppercorn, charred oak, tobacco leaf. The palate is all structure and tannin built around a solid, swirling core of black fruit. The aftertaste is wonderful. A blend of regions, vineyards, and a blend of French (25% new) and American (9% new) means this wine is so immediately identifiably Bin 407. Made in the image of Bin 707, this is drinkable far before its bigger brother. Red fruits, crab apple florals, crushed peppercorn, Kalamata olive, poached strawberry – this is bloody delicious. Ripe raspberry, blackcurrant, red apple skins, hints of juniper, bay leaf… raw cocoa, chewy tannin. Oh boy do I love this. Plush. Lush. Plump. Structural. This. Is. Very. Good. The classically Australian cab/shiraz blend just makes so much sense: never more so than when you get 389 in the glass. The structure of the cabernet fruit marries perfectly to the plushness of the shiraz, making this a wonderful expression as a sum of its parts. 12 months in American (37% new) hogsheads. Glorious now, or well into the future. This is pure fruit on the nose: elegant and pretty. I always love this wine, this vintage is no exception. The palate has star anise, salted liquorice, red liquorice, jubes… ripe summer raspberry. The tannins are polished (like whipped egg white). Supple and gorgeous. The aftertaste has hints of black olive tapenade and green peppercorn. 12 months in 50 year old large oak vats. Confirming that this is one of the best premium red buys of the release, as per usual. Magill Estate Shiraz: the only single vineyard wine in the Penfolds release. On the nose there is lavender, geranium/nasturtium, blueberry. It is elegant and pretty, yet serious. Formidable structure through the finish. This is all about line, length and finesse. It is polished. Blue fruits, black pepper, there is a hint of something like crushed almond, rose petals and red liquorice. 13 months in new French and American oak hand-picked, basket-pressed. Chinotto, blood orange, blood plum. A savoury palate, chewy tannins – there is restraint here – honestly I like this an awful lot! It is old school, unapologetic, balanced. It will be great in time, but it is great now, too. Now THAT is a mouthful. Tannins are pervasive but enjoyable. Crushed coffee, blackberry, tomato leaf, bay leaf... If I had to choose a most memorable red from this release, one that both surprised and delighted, it would be this – the RWT. 12 months in French oak (72% new). A muscular, firm and strangely alluring wine. A sweet nose. The oak is so boisterous right now – 20 months in new American hogsheads. This needs time to absorb and come together. Built for power, not speed. Powerful and structured. This is by no means made every years. Since 1964, it has skipped 10 vintages due to unfavourable conditions – this is made only in the best vintages, and made for the long haul. Older 707’s have been beguiling and luxurious, so I can only assume that this will be exactly the same in time. Wowee… after much (much) swirling to bring out the nose… summer florals waft out of the glass. Sun warmed pink bud jasmine, alongside charry oak and abundant red fruits… this is powerful, dense, layered and long. There is salt-bush, nasturtium, crushed slate, raspberry, mulberry, red liquorice and an umami rich back-palate of hoi sin and soy, which pulls me in for another sip, more than anything else – like a curled and beckoning finger. It is restrained and closed right now; the flavours are all locked up, although there are symphonic red fruits rising already. The tannins are glossy and chewy. Grange spends 20 months in new American oak hogsheads.